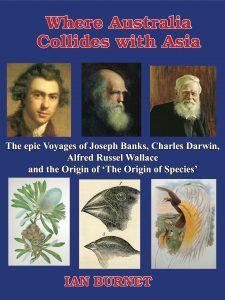 This book follows the epic voyages of Joseph Banks, Charles Darwin, and Alfred Russel Wallace through the voyage of Continent Australia after it breaks away from Antarctica 50 million years ago with its raft of Gondwanaland flora and fauna and begins its journey north towards the equator. The voyage of Joseph Banks on the Endeavour, who with Daniel Solander became the first trained naturalists to describe the unique flora and fauna of Continent Australia that had evolved during its 30 million years of isolation. The voyage of Charles Darwin on the Beagle, who after his observations in South America and the Galapagos Islands, sat on the banks of the Coxs River in New South Wales and tried to rationalise his belief in the idea of biblical creation and understand the origin of species. The voyage of Alfred Russel Wallace, who realised that the Lombok Strait in Indonesia represents the biogeographical boundary between the fauna of Asia and those of Australasia. On the Asian side are elephants, tigers, primates, and specific birds. On the Australasian side are marsupials such as the possum-like cuscus and the Aru wallaby, as well as birds specific to Australia such as white cockatoos, brush turkeys, and the spectacular Birds of Paradise. It was tectonic plate movement that brought these disparate worlds together and it was Alfred Russel Wallace’s ‘Letter from Ternate’ that forced Charles Darwin to finally publish his landmark work On the Origin of Species. Come on a year-long photographic journey to the most remote and biodiverse forests in eight different countries in Asia and learn about rarely seen, let alone photographed, endangered animal species. 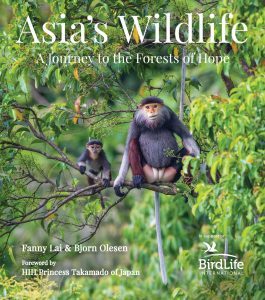 Produced to raise funds and awareness of nature conservation through their Forest of Hope program; Asia’s Wildlife is a mesmerizing account of the expedition taken by Fanny Lai and photographer, Bjorn Olesen to observe, photograph, and describe Asia’s most distinctive animal species. And many, many more fascinating creatures! Ongoing conservation efforts to protect these precious forests are described as well as the real threats to the future. Artist/Author: Campbell, Elaine J. F.
The tropical lowland rain forest in Sabah is one of the richest ecosystems in the world. 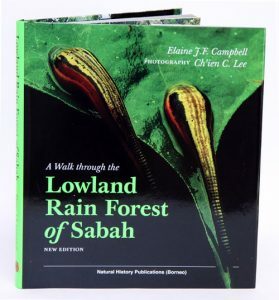 This account puts together an introduction to the rain forest and its many biological facets with awe inspiring photographs by wildlife photographer Ch’ien C. Lee and notes by naturalists who have been fascinated with the living treasures found in Sabah. 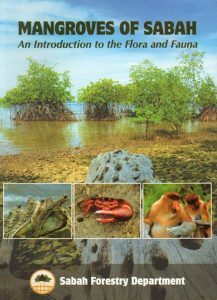 Written and compiled for the enjoyment of naturalists, students and travellers alike, the book will be a special adventure revealing the wonders of the lowland rain forest and its many magnificent plants and animals. The book is a special reminder of the wounds of the lowland rain forest and its many magnificent, but vulnerable plants and animals. Artist/Author: Nilus, Reuben et al. To the casual eye, mangroves do not look like any other forests, but they thrive in this amphibious environment. Every living being is a product of the environment, moulded by intricate events throughout its evolutionary history. Nature endows mangrove communities with ingenious adaptations for success. As such, many associated life forms have found a niche in the mangroves. Of the 340,000 hectares of mangroves in Sabah , over 90% are still largely intact, and most of these areas are under Sabah Forestry Department. Realizing that mangroves are important natural resources, efforts have been made to manage them in accordance with the principles of conservation and sustainable use. Wild Sabah: the magnificent wildlife and rainforests of Malaysian Borneo. Artist/Author: Payne, Junaidi and Cede Prudente. A magnificent photographic evocation of the natural splendours of the state of Sabah in Malaysian Borneo. 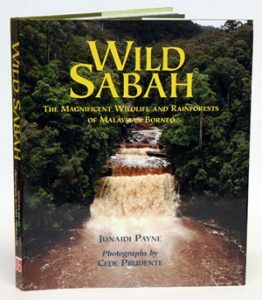 From the peaks of Mount Kinabalu, the highest mountain in Asia between the Himalayas and New Guinea, to the floodplains of the Kinabatangan river, Sabah teems with wildlife, and the natural history of the region is described with verve and passionate enthusiasm by expert author Junaidi Payne. Landscapes, scenery, and natural species are portrayed in Cede Prudente’s spectacular accompanying photographs. Two full-page maps show physical terrain, climate, vegetation, and the principal wildlife watching sites. The largest protected wildlife area in Sabah, Tabin Wildlife Reserve is home to an exceptional array of Borneo’s rare and endangered species. The Sumatran or Pygmy Rhinoceros, the Bornean Pygmy elephant, Sabah’s iconic Orangutan, the pot-bellied Proboscis Monkey and countless other mammals are protected here. Thanks to it mineral-rich mud volcanoes, Tabin not only sustains a wide range of mammals but has a fascinating population of birds, while the rainforest teems with insects, frogs and other life. 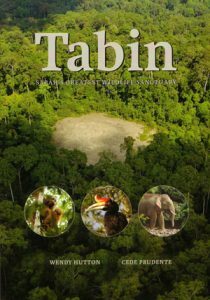 With its beautiful rivers and streams, magnificent plant life and the comfort of the easily accessible Tabin Wildlife Resort, Tabin promises countless opportunities for a richly rewarding wildlife experience. Artist/Author: Hazebroek, Hans P. and Abang Kashim bin Abang Morshidi. The Gunung Mulu National Park – a World Heritage Site – invites you to a breathtaking experience of some of the world’s most enthralling wonders of nature. 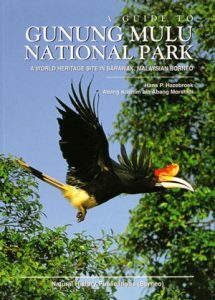 The Park is situated on the great island of Borneo, in Sarawak (a state within the Federation of Malaysia). Mulu’s impressive canyons, untamed rivers, serene rain forests, imposing mountains, spectacular limestone pinnacles, and magnificent caves rank among the world’s most outstanding scenery.